Tickets can be purchased from the Bus Driver on all our Buses. These Cash Tickets are Single Journey tickets that can be used to get to any destination within two hours, including interchanging. Rates vary between Summer and Winter months. Summer rates apply between mid-June and mid-October. 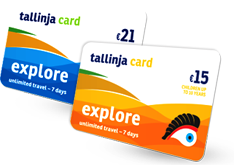 You can also opt for our tallinja cards. These are a range of bus cards offering added value and reduced fares to suit your needs, depending on your travelling patterns. 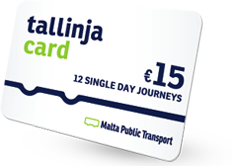 Regular commuters can opt to register for their personalized tallinja card. This offers reduced fares and the ability to top up the card with additional credit. Minimum top up amounts and card fees apply. Discover the Maltese islands with the ExplorePlus travel card, which gives you added value on your holiday. With over 2,000 bus stops strategically located all over the islands, travelling by bus has never been easier or more convenient. With the new ExplorePlus travel card, you get 7 days of unlimited travel on public transport, including direct services from the airport and to various beaches. No visit to Malta would be complete without a trip to Valletta, which is also accessible by a ferry on either side of the picturesque harbours surrounding the capital city. With the new ExplorePlus travel card, you get 2 trips on the Valletta ferry, where you can admire the spectacular bastions rising from the clear blue sea. Sightseeing options are also included in your ExplorePlus travel card. A full-day tour on the hop-on, hop-off buses visiting Malta’s landmarks is ideal for those would like to learn more about the island, with audio guides available in different languages. Those who would like to enjoy more of the sea can instead take a boat trip to Comino, home of the Blue Lagoon. With the new ExplorePlus travel card, you can choose either one of these options, which will make your holiday complete. The card is valid for seven days of travel from the first day the card is validated. With unlimited travel, the 7-Day Explore Card offers the best value for anyone wanting to explore our islands. You can go to all of Malta’s sites of interest, in any part of Malta and Gozo. You can hop on or off anytime, as many times as you want, and at any time. This card is valid for travel on day services and night services; So whether you are hitting the beach, visiting Ħaġar Qim, or going to a village festa, the card will offer you unlimited travel, any time of the day. The card is valid for seven days of unlimited travel starting from the first day and time that the card is validated on the bus. There is a card for adults, and another for children (up to 10 years old). The card may not be shared with other persons. Our cards are available for purchase at all our Sales and Information Offices and other leading outlets, and can be used immediately. Click here for information on where to buy your Explore Card. Our 12 Journey card is another easy and cost-effective way of getting around Malta and Gozo. Perfect for those using the bus every now and then, this card can be shared and is valid for one year. Planning a day out to the beach for the family? Purchase our 12 Single Day Journeys card, and you are given 12 Journeys to be used by all the family. Do you need to travel around between meetings, or for a meeting? This is the product you need. Keep it at hand, and just hop onto a bus. You can also use this card on Night Services. You can use it for 12 Single Journey Tickets on Day Services or 6 Single Journey Tickets on Night Services, or a combination of both. This card expires within twelve months from first use. Click here for information on where to buy your 12 Single Day Journeys Card.